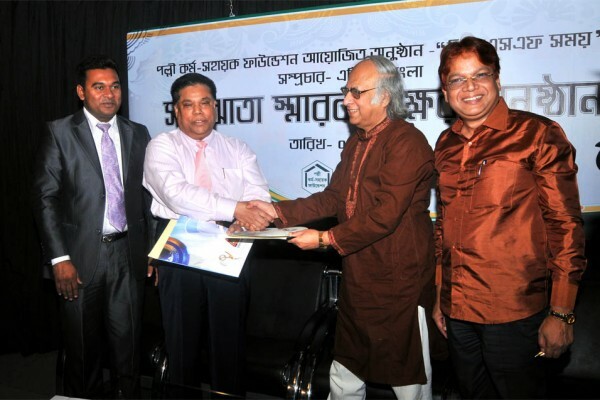 A Memorandum of Understanding was signed between Palli Karma-Sahayak Foundation and the popular TV Channel ATN Bangla in this connection on May 5, 2014. The signing ceremony took place in the office of ATN Bangla. The brief signing ceremony sparkled with some extra-ordinary glare with the presence of the Chairmen of both the renowned institutions. Dr Qazi Kholiquzzaman Ahmad, Chairman, PKSF exchanged the document with Dr Mahfuzur Rahman, Chairman, ATN Bangla. This TV Channel, widely popular both at home and abroad will help promote the media exposure of the innovative and inclusive activities of PKSF and thus would highlight PKSF’s increasingly positive role in the comprehensive development activities of the country. Initially signed for one year though, both the organizations hope just not to renew the agreement but also to renew and reinvigorate their mutual role from their individual perspectives to change the lot of the toiling masses. It may be further mentioned that PKSF has been pronouncing its presence in the satellite through a weekly programme, being telecast on another popular TV Channel, Banglavision, for the last three years. That programme, known as Unnayane PKSF, has already drawn attention of people of diverse sections. While the present show was designed in the form of conversation to disseminate information, the forthcoming one in ATN Bangla will be structured on documentary presentation and discussion. Dr Jashim Uddin, Deputy Managing Director (Admn. & Finance), PKSF signed the MoU on behalf of the Foundation, while the signatory for ATN Bangla was Dr Mahfuzur Rahman, Chairman, ATN Bangla.